1. How do I get to the Hogwarts Grounds? If you are too young to Apparate to nearby Hogsmeade, and you have no enchanted Ford Anglia at your disposal, I guess you'll have to resort to some sort of Muggle transportation, which for most of you means an unenchanted automobile of some sort. There is no driving map included with your letter because we all know from "Hogwarts, A History" that Hogwarts is Unplottable - however, MY address from the address label on the back of your Owl Post CAN be plotted easily by the map engine of your choice (Yahoo! Maps, MapQuest.com, etc). Fear not! 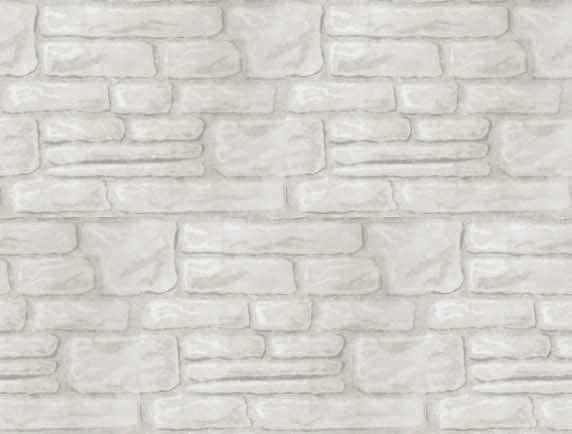 If you can't attend, or if you just want to show your friends & family what a totally geeky Potter fan you really are while you are attending, the party will be webcast at http://camera.britta.com! 3. Hooray, I can attend! But I have some other Potter fans I know who would love to come...? Sure! Bring them along...if you could please let me know how many people you are bringing when you RSVP, I would appreciate it...gotta have enough pumpkin juice & treacle tarts to go around, you know! Yes, children are welcome! Along with the many adults, so far I have heard of at least five children planning to attend, ranging in ages from 0 to 9 years old so far. There will be a children's activity area outside in the side yard, and at 6pm we will have a treasure hunt for the young wizards and their parents. You are of course welcome to bring toys of your own as well if you like. My only other comment is that since I do not have children consistently at my house, even though I will try my best to make everything as safe as possible, my house is not childproofed, so please take responsibility for watching your own children inside as well as outside. 5. What if I'm coming from far away? My guest room has already been claimed by a long-distance traveler & her young son, so I can't offer the rest of you privacy, but I do have a couch, a loveseat, and plenty of floorspace with extra pillows and blankets for anyone who would like to stay the night. 6. Do I have to come in costume? As Professor McGonagall wrote in her letter to everyone, it will be safe to wear wizarding attire BUT dressing in the Muggle manner is not a problem, since she is aware many guests will need to arrive via Muggle transportation and would not want to arouse suspicion. 7. Will there be a costume contest? Yes, the categories are Most Authentic, Most Creative, and Best Costume, so start planning your costumes now! I have already heard of some GREAT ideas, so the competition should be fun to see! 8. Should I bring any food or drink? Yes please! 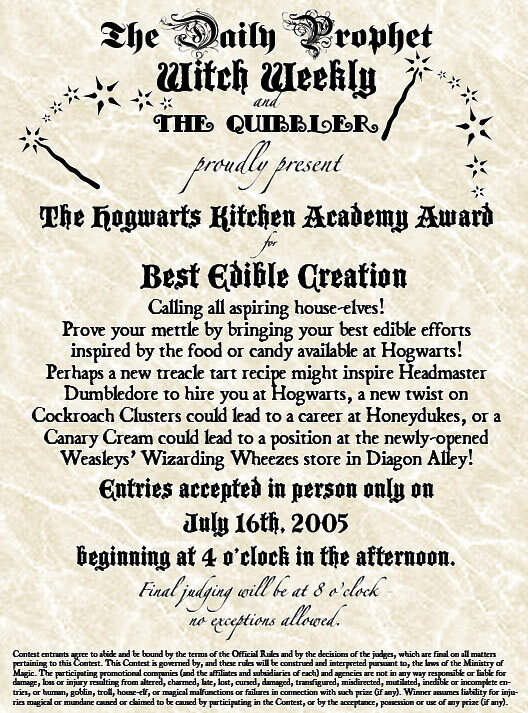 As you saw on the flyer enclosed in your owl post letter, Hogwarts is hosting a new contest sponsored by The Daily Prophet, Witch Weekly and The Quibbler for the Hogwarts Kitchen Academy Award for Best Edible Creation (unofficially called the "Dobby"). For you aspiring house-elves, prove your mettle by bringing your best edible efforts inspired by the food or candy available at Hogwarts! Perhaps a new treacle tart recipe might inspire Headmaster Dumbledore to hire you at Hogwarts, a new twist on Cockroach Clusters could lead to a career at Honeydukes, or a Canary Cream could lead to a position at the newly-opened Weasleys' Wizarding Wheezes store in Diagon Alley! Be as creative as you like! Just please bring enough for all your fellow judges to have enough of a sampling to be able to give you a proper vote! The Hogwarts Kitchens will still be providing the standards like butterbeer, lemonade, assorted Honeydukes candies and other Hogwarts-style food, so I don't think you'll leave either hungry or thirsty if you just bring yourself and your appetite. Vegetarians should not be concerned about going hungry because the majority of the menu has been magically altered to meet your needs, but you can verify any dietary needs for yourself by checking my Hogwarts & Honeydukes Recipes page. 9. July 16th...why does that date sound familiar...Isn't that the same day that Book 6 is released? Will there be copies for sale at the party? Yes and yes! The start-of-term celebration for Year Six is July 16th because that is when we can finally read about Harry Potter's own Year Six at Hogwarts...hooray! We have already reserved TWENTY-FIVE copies at our local Borders bookstore just for the sake of party guests! About five copies are already spoken-for by party guests, so there are still copies available to reserve. We will only purchase the copies that are confirmed, then they will be available at the party in the afternoon. All you need to do is let me know that you are committing to purchasing one and then be prepared to pay us $19.47 for each book on the day of the party, then you will receive your own pristine copy of Harry Potter and the Half-Blood Prince! 10. Will we be Sorted when we arrive? Yes, the Sorting Hat will sort you into one of the four Hogwarts Houses at the party. We will try to keep characters in their established Houses wherever possible, however we might have to adjust slightly to be sure we have even teams for Quidditch. 11. Did you say "Quidditch?" Will we actually be playing Quidditch? Yes! We will be playing Nerf Quidditch in my backyard on the grass, but without broomsticks because the International Statute of Wizarding Secrecy of 1692 strictly enforces the 1419 Wizard Council decree that "Quidditch should not be played anywhere near any place where there is the slightest chance that a Muggle might be watching or we'll see how well you can play whilst chained to a dungeon wall." Complete adjusted rules will be posted alongside our Quidditch pitch. 12. Where did you get the Hogwarts seal?!? Is this one different than Year Five or the first invitation? I made the seal stamp myself out of Sculpey, then used with the purple sealing wax (actually FauxWax from www.FauxWax.com since it is more flexible and therefore easier to mail without cracking than resin sealing wax). Yes, the seal for Year Six is the same as Year Five but different from the original Hogwarts Celebration. For Year Six the purple sealing wax also has a magical sparkle effect. 13. How did you make the invitations? 14. But that Marauders' Map - are you crazy? How long did that take to draw?! ?